The Center for Women is honoring Brooke Jackson as our New Mother of the Month for May, 2018. New mothers are one of the largest focuses of our practice. The Center for Women has a monthly drawing for a New Mother of the Month gift. This mother is one that begins her obstetric care during the month she’s honored for. 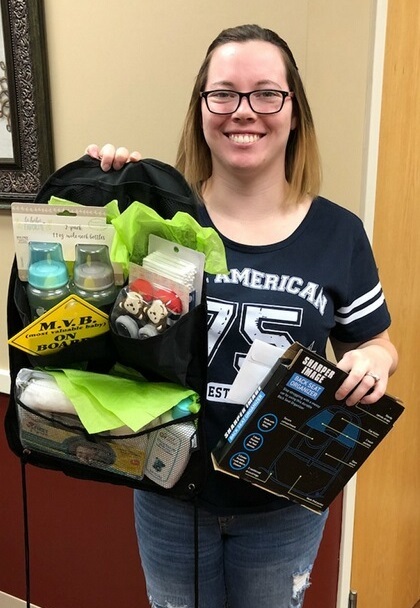 For the month of May, 2018, Brooke Jackson was the lucky mother! Thank you Brooke for choosing us to be involved in your, your family and your new little one’s life. We hope you enjoy us just as much. Have fun with your gift basket to celebrate the coming new baby! Thank you again Brooke for being another beautiful mother we get the pleasure of seeing! Women’s Health Care is vital in having a healthy mother and baby. So why chance your pregnancy health when you can ensure everything is going as planned. If you are pregnant and are in process of beginning your prenatal care, contact The Center for Women for your appointment to incorporate pregnancy health into your routine. It is as important as women’s health care and you will be so proud that you have taken care of both you and your baby. Call us today at The Center for Women (870) 425-7300 to make your appointment.